At the conclusion of Part 1, we shared 4 focus-points for this year. 1. Hire a full-time lab tech and provide funds to supplement the salaries. 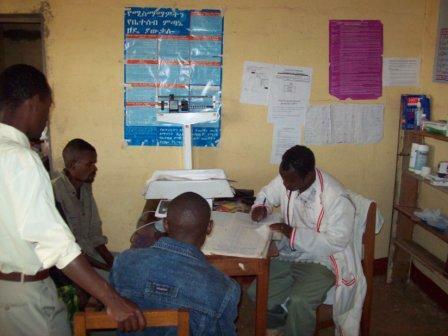 One of the goals of the Galana Clinic is that it be self-supported in terms of operating costs. This includes salaries. Over the next 3 years, the Clinic will absorb all its personnel costs. Current total salary cost is about $8,000/yr. 2. Provide good well water, with hot water from a solar apparatus, and internal running water with sinks. If our Lord is willing, a team of lay people will go with us to establish this plumbing system. We’re estimating $5,000 for the well, reservoir, and plumbing costs. 3. Develop some teaching CDs in the tribal languages of Burji. These will cover topics such as medical issues, health, hygiene, sanitation, and child care. Probably $500 is all we need for this project. 4. Obtain a vehicle. This is by far the greatest expenditure. We estimate that the cost is about $35,000. Why do we need a vehicle? 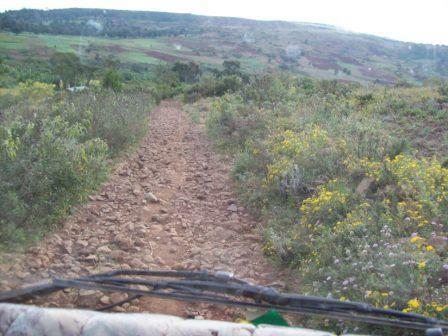 There are 5 main reasons why we need a vehicle for the Galana Clinic. 1. Ambulance. Currently, the clinic can handle only basic medical care. Anything that requires surgery, complicated childbirth, heart intervention, trauma treatment, etc., must be referred to the nearest hospital. This hospital is in a town called Dila. 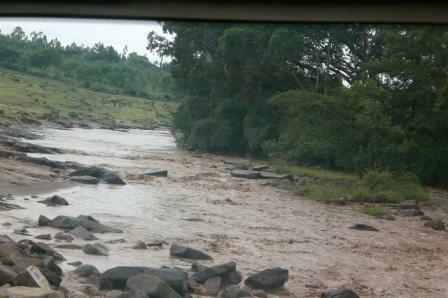 It is on the main north-south road from Addis to the Kenya border. Every time we travel to Burji, we pass through Dila. From the clinic, and traveling by private vehicle, the trip to Dila Hospital is a good 5 hours. 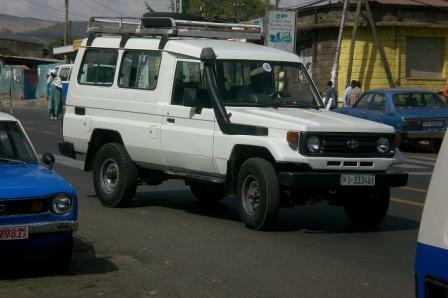 Ethiopians coming to the clinic do not have private vehicles. So when we refer a patient to the Hospital, the patient is put on a home-made stretcher, and is carried by several people down the road to Soyama Town; this trip takes several hours. Once in Soyama Town, the patient must find transportation to Dila. There are about 5 Isuzu trucks in Soyama Town; these trucks haul people and freight. Often they are out of Burji District for repairs or commerce reasons. There is one bus that connects Soyama Town with the outside world; its operation is unpredictable; many days there is no bus travel at all. There are no private vehicles in Soyama; the government has one vehicle. So you can see that when a patient’s condition requires referral to another medical facility, there is usually no transportation that accommodates emergency, or even semi-emergency, situations. Their only option is to walk with a stretcher, or try to balance the patient on the back of a donkey. Either way, the transport time is several days, and often the patient dies en route. If the Clinic has a 4WD vehicle, we can get these sick people to the hospital within ½ days’ travel, and hopefully get them the intervention they need to avert death. Burial place in Burji Mountains. 2. Guji Outreach. If you’ve been following our reports, you are familiar with the Guji tribe. This tribe lives in a large area next to the Burji area. They are very poor and are semi-nomadic. They have no medical facility of any sort in their area next to Burji, and because of the hostilities between the two tribes, they are afraid to come to the clinic for medical help. God has put it in our hearts to reach these people with the Gospel. It is only through the power of the Gospel that hearts can be changed and peace can reside in this land. We are already working with the Guji churches to try to make them stronger in the Lord. 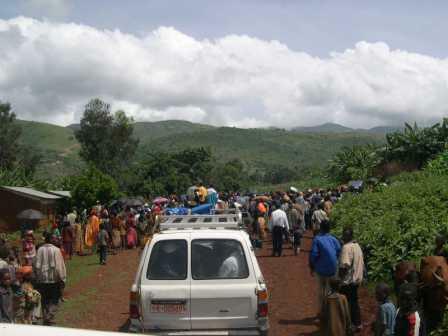 Our vision is to bring a mobile clinic to Guji territory, working with their own churches. Imagine! We could load medicines and diagnostic tools into the vehicle, along with the nurse, the pharmacist and the chaplain. After a few hours’ drive, this team could set up a clinic in a village or under a tree in a field. And while our nurse is treating medical conditions, our chaplain can explain about Jesus, His love and His power! But we need a vehicle. 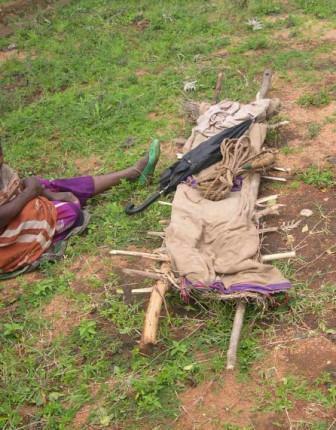 Guji woman with child on her back. Showing the Jesus Film to Guji people. 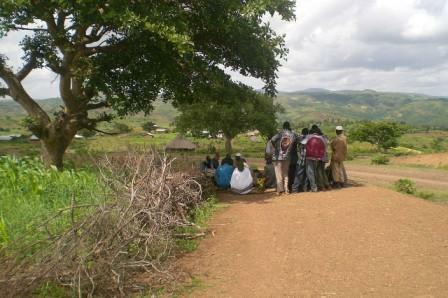 Guji people listening to the Gospel. Dave with Guji church leaders. 3. Mobile Medical Work. Similar to the Guji Outreach, we could use the vehicle to reach places that are distant from the clinic….over the mountains, beyond the river, etc. By going out to the people, we can maximize our ministry, both medical and spiritual. Distributing eyeglasses in the mountains. Taking medical care to distant villages. Coordinating with rural churches like this one. A woman with her child and goat in a village. 4. Safe Transport of Clinic Supplies. Currently, the equipment and pharmaceutical supplies we need for the clinic are brought the long distance to Burji in the back of an Isuzu truck. People, animals and cargo share this space. It is not safe from thievery or damage. It is open to the elements, so dust and rain affect our clinic supplies. If we had a vehicle, we could safely transport the precious medicine and supplies that are needed. Current transportation for clinic supplies. 5. Assist our Teams in Ministry. We are regularly taking teams to Burji for ministry. In November, 2008, there were 12 of us. 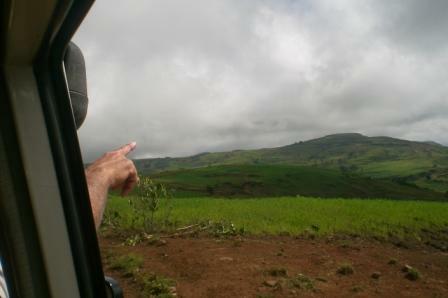 We divided into 5 teams, going in 5 different directions and changing locations every few days. Add rugged terrain, potential vehicle break-downs and a myriad of other issues, and you can imagine the challenging logistics this presents. In November, the Alaba church was kind enough to loan us their vehicle; for most of our trip it was the ONLY vehicle we had! If we get a vehicle for the clinic, it can help us get where we need to get during our ministry trips. 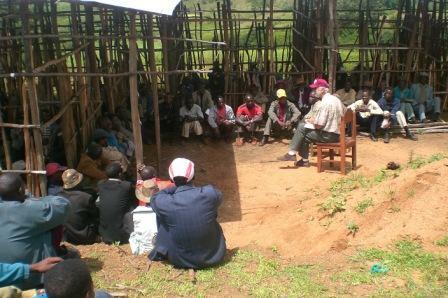 Dave teaching men in a distant village. 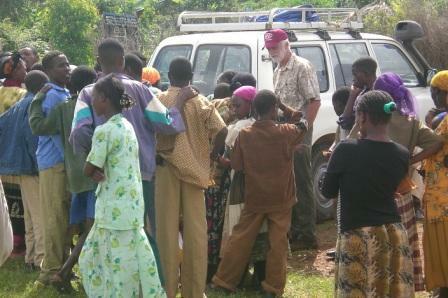 Using a borrowed vehicle for ministry in 2006. People greeting our ministry Team, 2007. So there you have it….4 focus points for this year at the Galana Clinic. These are big-ticket items during a year of major recession. But we figure that if the Federal Reserve can manufacture money, so can the Lord of the Universe! He has His people and He has prepared them for work in His Kingdom. As we work with the local Burji churches thru the clinic ministry, our goal is one thing: the expansion of the Lord’s Kingdom thru the avenue of medical work. Please continue to pray for this work….and together, let us watch for His glory!